Carlos looks quite chuffed, not quite sure why…? What has been a difficult weekend for Alstare Ducati got a whole lot better today in Phillip Island as their main man Carlos Checa stormed to pole position in style, clinching the top spot by almost 2 tenths over nearest rival Eugene Laverty. Checa had what he claimed to be one of the biggest highsides of his career in practice on Friday and is also recovering from a stomach bug, therefore didn’t have high expectations for this weekends qualifying. In the first qualification session on Friday, the Spaniard only managed 12th and in QP2 this morning he could only improve that to 8th. Despite a steady start to superpole he charged to pole position with his flying lap in the final superpole session – a record breaking 1’30.234. Checa had this to say: “Winning Superpole was a great surprise for me and is down to all the hard work put in by my mechanics, the physios and the rest of the Clinica Mobile medical staff. This morning, I felt pain in both my shoulder and foot and I really didn’t think I’d be competitive in qualifying and Superpole. The mechanics did a great job and made the bike easier for me to ride and by the time Superpole started this afternoon, I felt pretty good really – better than I thought I would! In Superpole, I felt no pain and could attack without a problem. I like this track and have a lot of experience here, so I was able to push hard, but I really didn’t think I’d be able to go so fast and the lap time was a bit of a surprise to me. Checa’s team mate, Badovini had to sit out Saturday and will not race tomorrow after sustaining a broken bone in his foot following a crash on Friday. The Italian also went down hard in testing at the beginning of the week. 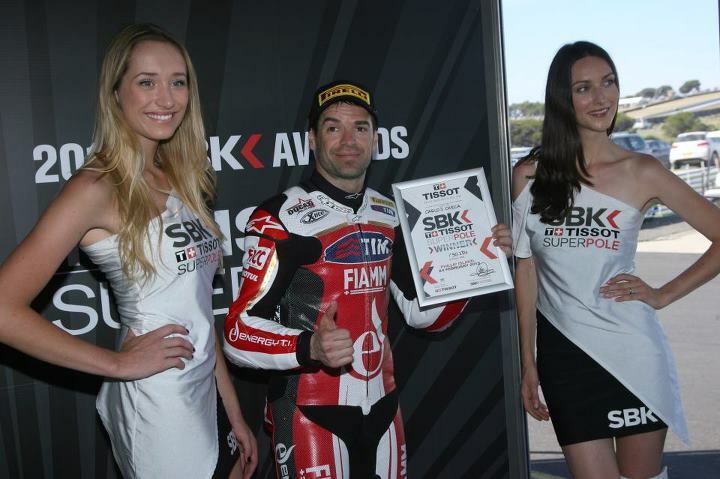 A full report and times from superpole can be seen here. Previous Previous post: Haslam: Superpole was a disaster.